According to the online survey, conducted by the Youth Department of the Council of Europe in 2012, Muslims are the second group most targeted by hate speech online. Anno 2017, this has not changed. The Annual Report 2016 of the European Commission against Racism and Intolerance found that across Europe Anti – Muslim arguments are no longer confined to the fringes of society and are now also embraced by some mainstream politicians resulting in growing xenophobic populist discourse. ECRI reports that Muslims continue to experience discrimination in various areas of social life, including education, employment and housing, expressed through hate speech, violence or ethnic and religious profiling. Muslim women wearing visible religious symbols, such as the headscarf, are particularly vulnerable to discrimination due to the intersectionality of gender and religion. The report highlights that such negative experiences can fuel feelings of isolation within a larger community and hinder inclusive societies. It can also contribute to a more general disintegration of human values, such as non-discrimination, tolerance, freedom of religion, solidarity and equality. The No Hate Speech Movement organised the first action day on combating Islamophobic hate speech in 2014. 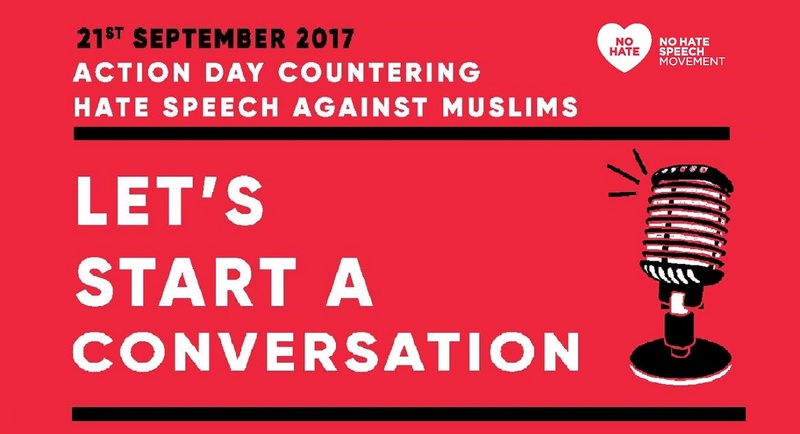 This year the movement will organise an action day to counter hate speech targeting Muslims on the occasion of the International Day of Peace. By focussing on the persons affected by hate speech, instead of the phobia of the Islam and its subsequent negative connotations, the movement wants break the increasing dichotomy between “us” and “them” that has developed in the public discourse of many countries. (ECRI annual report 2016). The xenophobic populist discourse portrays a non existing link between Refugees, Muslim faith and recent terrorist attacks in Europe. This simplistic xenophobic narrative does not reflect the reality where refugees of many different faiths seek safety from war and conflict, nearly all European muslims live peaceful in their community for decades, sometimes centuries, and most recent terror attacks were perpetrated by nationals of the countries affected. On 21 September, the International Day of Peace, the No Hate Speech Movement calls for positive dialogue with Muslims in Europe. Dialogue can decrease stereotyping and judgement, and strengthen counter and alternative narratives that debunk hate speech and its underlying xenophobic narrative. Click here for ideas for offline actions and activities that can be organised with and for young people on the occasion of the International Day of Peace on 21 September 2017. 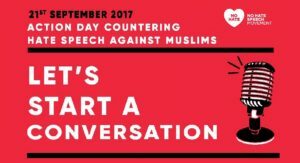 Click here for ideas for online actions to counter hate speech targeting Muslim people on 21 September 2017.